Companies 'Named And Shamed' For Bad Behavior Public humiliation has long been used as a deterrence mechanism for everything from adultery to drunken driving. Now judges in Massachusetts are ordering companies guilty of crimes that harm the community of publicly acknowledge their wrongdoings in newspaper ads. Critics say the practice is more retribution than deterrence, though. 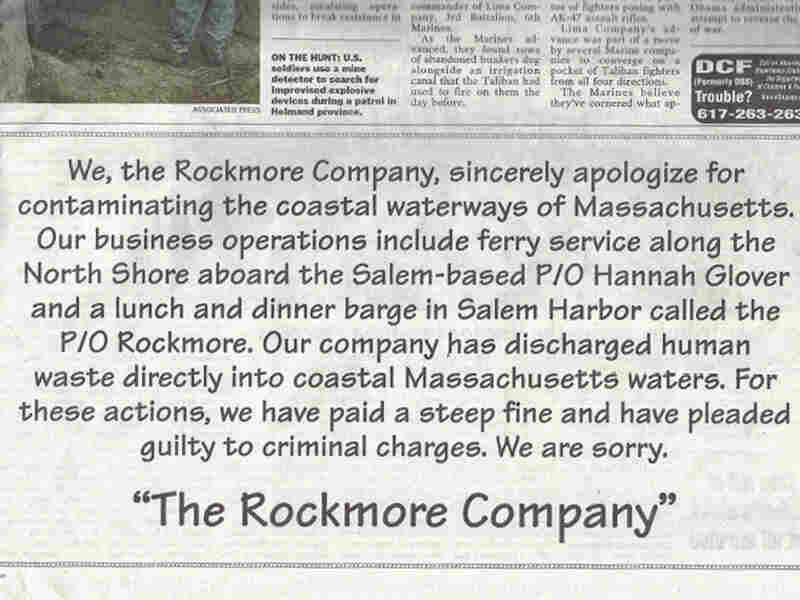 The Rockmore Co., a Massachusetts ferry service, was ordered by a judge to place an ad in the newspaper publicizing its breaking the law by dumping human waste into coastal waters. Newspapers are full of apologies these days, from Toyota to Tiger Woods. But papers in the Boston area are also running a growing number of "mea culpas" that are ordered by the courts. Increasingly, companies that plead guilty to crimes that harm the community — polluting, for example — are being required to publish an apology as part of their punishment. "Our company has discharged human waste directly into coastal Massachusetts waters," reads an ad in the Boston Herald placed by The Rockmore Co., a local ferry operator. "That's pretty ... that's bad," says Cindy Cisco, from her spot at a coffee shop in Marblehead, Mass. "That's terrible." The ad says the company has paid a "steep fine," but people in the area seem more moved by the price the company is paying in reputation. "I think it's great, because they're going to learn their lesson," says hairdresser Danielle Yocum. "They're probably not going to put human waste in the ocean again." Former federal prosecutor Michael Sullivan has helped increase the use of these kinds of sanctions in Massachusetts, especially with companies that run afoul of environmental laws. The goal is deterrence, and Sullivan says the high-profile mea culpas also tend to be more satisfying to a public increasingly frustrated by corporate wrongdoing. "I think that's what might frustrate the public — when it doesn't appear that the company has been punished sufficiently enough, by simply writing a check," he says. "It's simply the cost of doing business when you're caught." There are times when we do want to put the hurt on a corporation especially if it’s a corporation who hurt the community. The "scarlet letter" treatment has long been used to sanction individuals, from shoplifters or drunken drivers confessing their crimes on sandwich boards to the public shaming used back in Puritan times. "You would like to think that sentencing is evolving to move away from these types of public shaming. We got out of doing that for a reason," says Stellio Sinnis, a federal public defender. Sinnis represented a Massachusetts fisherman who purposely sunk an old boat. When he was caught, the fisherman had to run an ad saying that cutting corners was "not worth it." He offered to go on a speaking tour to make that point directly to other fishermen, but prosecutors insisted on the newspaper ad. Sinnis questions whether the goal was really more about a kind of retribution than deterrence. "When you impose a sentence that embarrasses family members and creates hardship — public humiliation and public ridicule — and kind of ostracizes someone from the community, I think it's gratuitous, and that's just counterproductive to what you want to achieve," he says. Some offenders have appealed their sentences as cruel or unusual, but the courts have ruled that humiliation is within the bounds of fair punishment. Still, shaming sanctions continue to raise age-old questions about making a punishment fit a crime. "Whether we call it vengeance, whether we call it psychic satisfaction, whether we call it restitution, we are getting at the core of what we as victims can rightfully claim to be entitled to," says Ohio State University law professor Doug Berman. Berman says judges must be careful when shaming individuals, but they don't have to worry the same way about scarring a company. "Corporations don't feel," he says. "There are times when we do want to put the hurt on a corporation, especially if it's a corporation who hurt the community." When it comes to shaming corporations, Berman says, the real question is: Does it work? Judges ought to be encouraged to try to find out, he says.